Bad dog breath can be a bad problem for your dog and you, at times their breath an be unbearable and make bonding with them a chore you'd rather avoid at all costs. 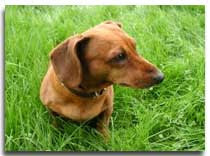 This may not be due them and more down to the care you have not realized that your dog should have. Dog's bad breath like most other dog symptoms can be the cause of many different issues separately or together, this makes the cause hard to diagnose without a proper examination from a professional dog carer or vet. Maybe your dog is finding it hard to eat or swallow which can lead to dog's bad breath and other illnesses that are related. Saliva drooling from your dog's mouth may also be a cause of bad breath, as more saliva gets built up in their mouth is makes it easier for bacteria to breed resulting in bad breath. The last and most common form of bacteria build up is from not cleaning or not properly cleaning your dog's teeth, this enables tartar to form and make the bad odour you are forced to smell day in day out. Many believe that food choice and what you feed them is a problem when dog breath is concerned, as this may be true to an extent this is more of a temporary short term problem and the reason above is more likely to be the problem cause. There are plenty of dental hygiene products available in pet shops and online, some work better than others on different ones but you best bet is to clean your dog's teeth regularly to stop the bacteria build up, this is where the problem begins and where you should target your efforts. 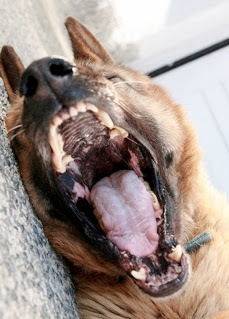 If you fear the problem has got too far to recover or damage or the gums and teeth is visible you should contact your vet as soon as possible for help and a proper diagnosis of your pet.